Most people who have heard of Fannie Lou Hamer (1917-1977) are aware of the impassioned testimony that this Mississippi sharecropper and civil rights activist delivered at the 1964 Democratic National Convention. Far fewer people are familiar with the speeches Hamer delivered at the 1968 and 1972 conventions, to say nothing of addresses she gave closer to home, or with Malcolm X in Harlem, or even at the founding of the National Women’s Political Caucus. Until now, dozens of Hamer’s speeches have been buried in archival collections and in the basements of movement veterans. After years of combing library archives, government documents, and private collections across the country, Maegan Parker Brooks and Davis W. Houck have selected twenty-one of Hamer’s most important speeches and testimonies. 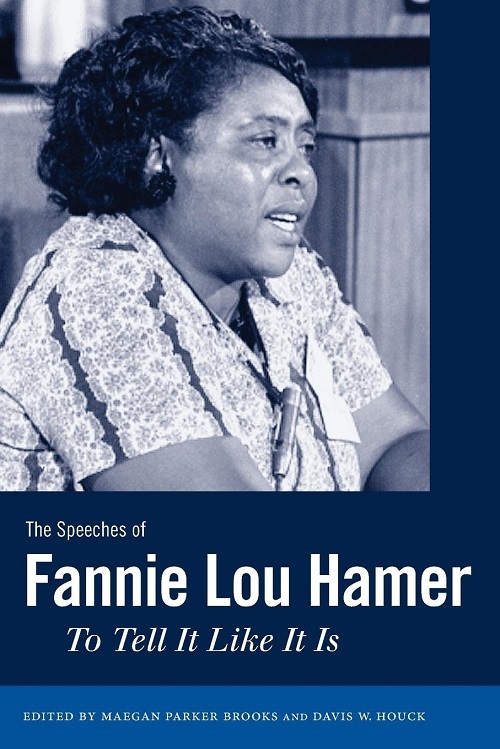 As the first volume to exclusively showcase Hamer’s talents as an orator, this book includes speeches from the better part of her fifteen-year activist career delivered in response to occasions as distinct as a Vietnam War Moratorium Rally in Berkeley, California, and a summons to testify in a Mississippi courtroom. Brooks and Houck have coupled these heretofore unpublished speeches and testimonies with brief critical descriptions that place Hamer’s words in context. The editors also include the last full-length oral history interview Hamer granted, a recent oral history interview Brooks conducted with Hamer’s daughter, as well as a bibliography of additional primary and secondary sources. The Speeches of Fannie Lou Hamer demonstrates that there is still much to learn about and from this valiant black freedom movement activist.